Last month, I had tea with my friend Kerry, who was raised in a conservative Mennonite community in Blumenort (Manitoba). We talked about how the rhythms of time we learned in faith and childhood shape us long into adulthood. Feel free to make yourself a pot of tea and join us at the table! Not sure what to read next? Earlier this month, I contributed to the Orthodoxy & Heterodoxy Blog’s post-a-day extravaganza in honor of the upcoming 500th anniversary of the posting of the 95 Theses, which marked the start of the Protestant Reformation. My post was about Luther and his apocalypticism. Read all it here, and make sure to peruse the other fine contributions! 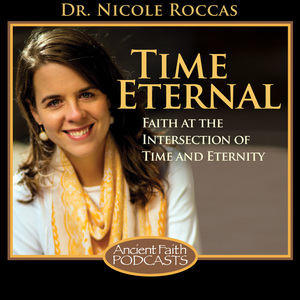 Don’t forget to “like” Time Eternal on Facebook to stay up to date with all manner of timely thoughts and reflections. Show notes for "Time in Transit"